Are you a company cardholder? If so, here are the answers you've been looking for. Do I need to add the card myself or will this be done for me? When will I see/How can I see my card transactions in Expensify? What if some transactions are missing from Expensify? What about adding the receipt images? How do I report my company card expenses? 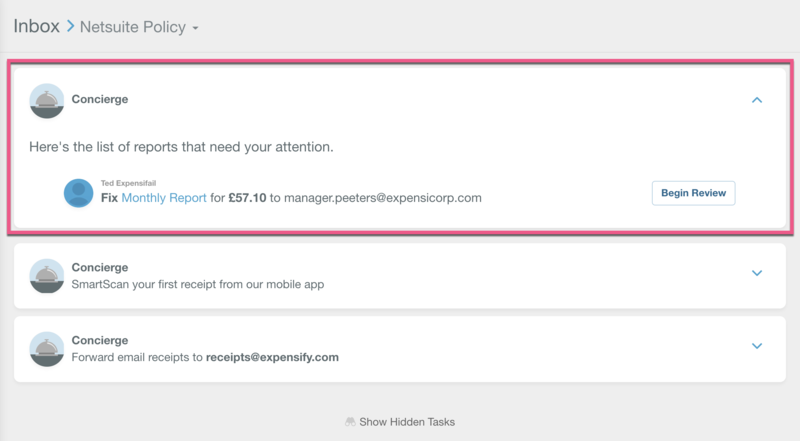 Reporting expenses incurred on a company credit card is easy with Expensify. Concierge will do this automatically for you, but if not, check out this guide to resolve before you submit. Check your report for violations and required fixes using Guided Review and submit for approval. Your company admin will let you know what to do here. 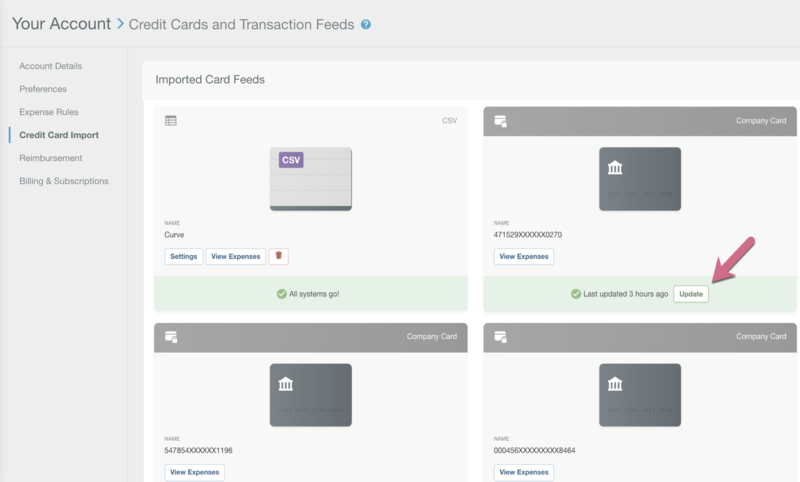 99% of the time, company cards are assigned centrally by your company admin. As a submitter, all you will need to do is wait for the card to show up in your Settings > Your Account > Credit Card Import page and for expenses to begin automatically populating on your Expenses page. If you are required to add your card to Expensify yourself, this can be done by following this guide. 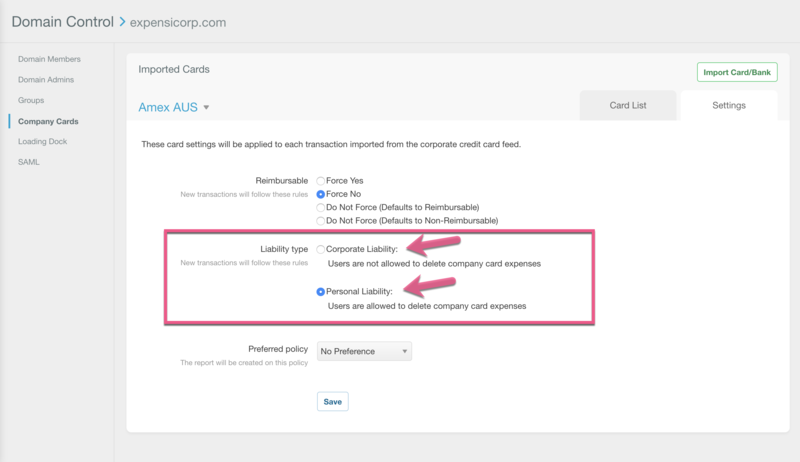 There are three types of card that can be found by going to Settings > Your Account > Credit Card Import. Company cards with the card and padlock icon are assigned by a company admin. Only the admin can delete* this card. Personal cards with the card icon are added by you. You can delete* this card by clicking the red trash icon. CSV cards with the spreadsheet icon is a file uploaded by you. This does not auto-update and can be deleted. *Deleting a card will remove any Unreported or Open transactions in the account. Learn more about expense and report statuses. Card transactions will begin to show after the card has been assigned to you. Depending on what start date your admin sets, you may also see some historical transactions populate into your account. You'll want to reach out to your company admin for any questions about these. 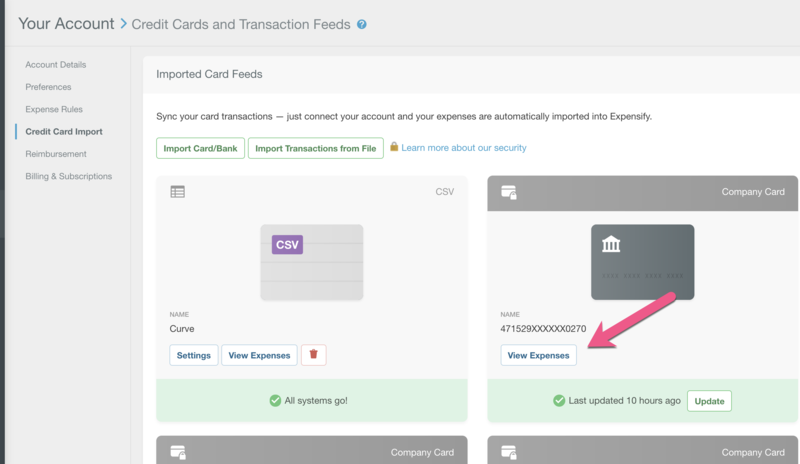 You can view all transactions associated with a card on the Expenses page (or by selecting "View Expenses" from the Settings > Your Account > Credit Card Import). 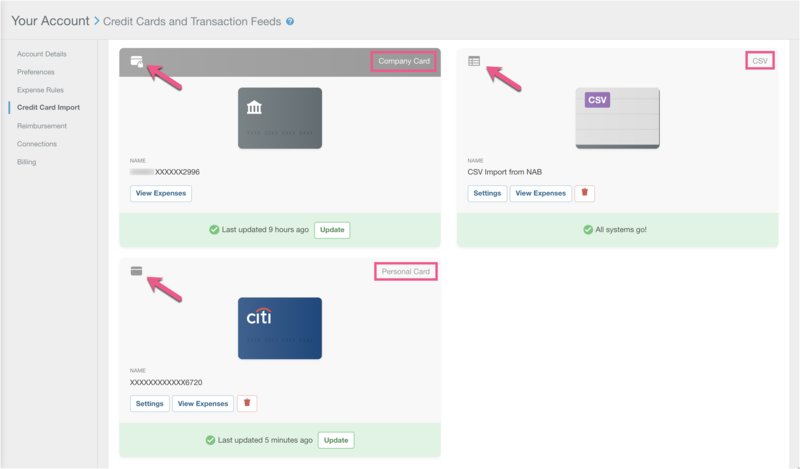 You can tell the difference between imported transaction types by the icon associated with them. Check out this link for more on the card and cash icons. What if some expenses are missing from Expensify? If this still does not download the transactions, follow our troubleshooting guide. Finally, if none of these avenues work, escalate the issue to your company admin who can attempt to resolve the issue centrally or needed, work through the issue with the Expensify Support team. What about adding the receipts? SmartScan is the technology which automatically extracts the data from your receipts. Once that receipt is imported to Expensify, it will initially be noted as a Cash expense, but when the corresponding card transaction imports to your account, the cash receipt and card transaction will automatically merge to create a Card Expense. 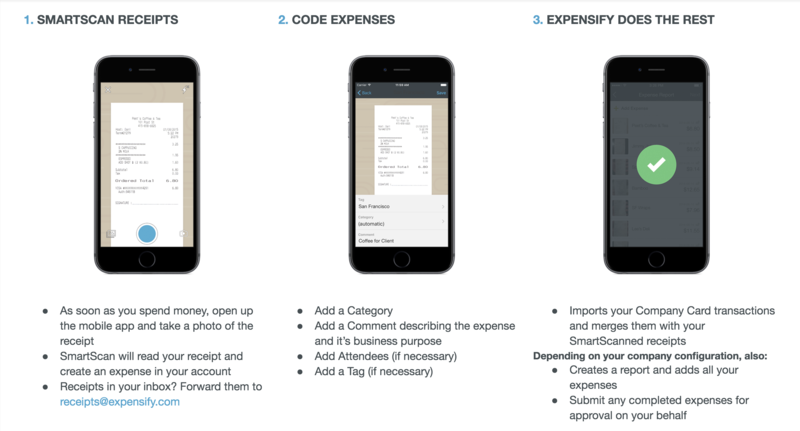 Expensify's eReceipts are full digital replacements of their paper equivalents in the US for purchases of $75 or less (as per requirements for IRS Documentation as per Publication 463). This means that if your company allows, you can ignore paper receipts entirely, no typing and no SmartScanning required. And why don't I have them for my hotel expenses? The IRS will not accept an eReceipt for purchases on lodging, for example at hotels and motels. For more check out the eReceipts help doc. Why aren't my receipts automatically merging? Receipts occasionally won't automatically merge with your card expenses. This shouldn't happen if the three steps outlined in the image above are undertaken. In the event this does occur, check out our merge troubleshooting help document and to manually resolve two unmerged transactions, follow these steps. Why do I have multiple reports? When using Scheduled Submit, Concierge will not automatically submit (and approve) expenses on reports which contain Expense Violations. These will be moved to a new report creating an extra report for the current reporting period. How does my company want them submitted? Your company admins will have put in place a set of "Policy Rules" that mirror the company expense policy. These will flag as Expense Violations for you to fix before they can be Approved. Anything that requires an action from you to bring your current expenses in line with the company policy will be flagged in your Inbox. What does my finance team want from me? 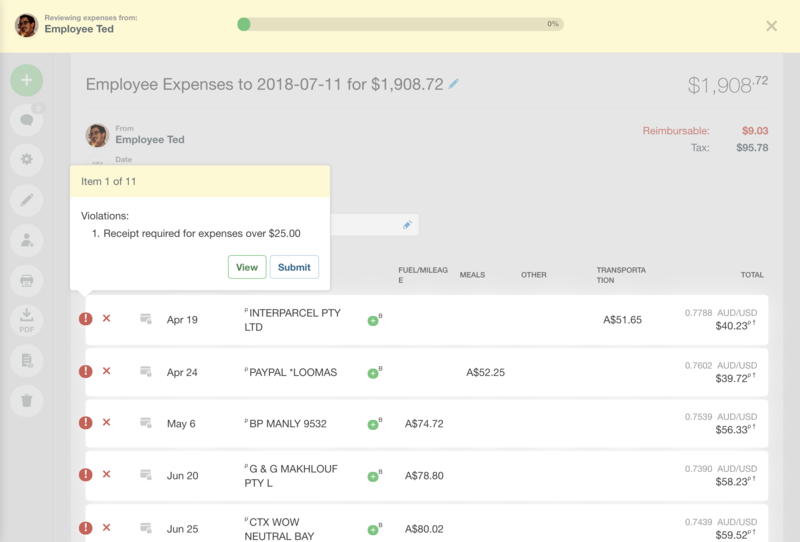 Most finance departments will want all company card transactions submitted with a corresponding receipt merged into the expense, with no violations or confusion about these expenses. (You can always alleviate any confusion by making use of the Expense Comment field or Report History & Comments). They will need to be able to reconcile all of your credit card purchases in Expensify with their monthly statement from the bank. 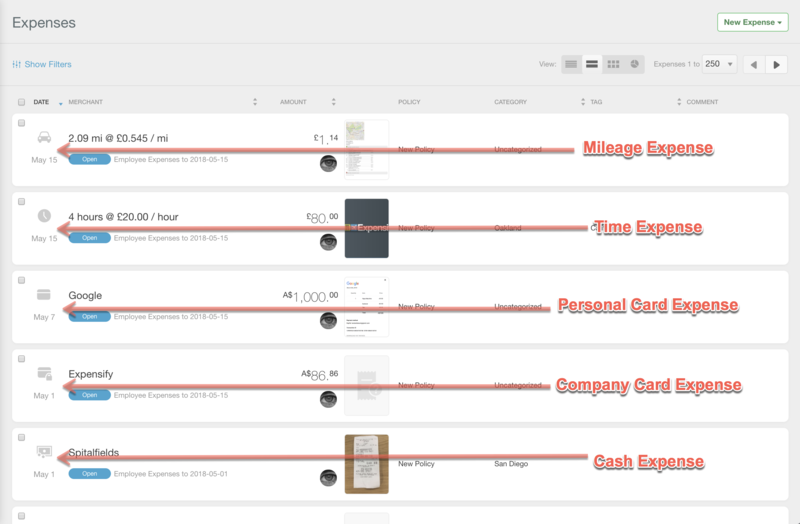 Expensify has a great tool called the Reconciliation Dashboard to help them with this task. Can I delete Company Card expenses? It's rare that Company Card expenses should be deleted - after all, every purchase made is usually going to require reporting back to you finance team. The ability to delete and move company card expenses between reports depends entirely on how your admin has configured the Liability. What is Corporate or Personal Liability? This is a setting enabled by your company admin which determines whether you can delete your imported card expenses or move them to a different/new report. If you find yourself unable to delete or move your card expenses, check with your company admin whether they've selected a Liability setting that would allow you to first! Note: when an Admin updates this setting, it will only update for transactions imported after the change. Expensify will detect duplicates as outlined in our Duplicate Detection document. You have not forgotten to merge a Cash and Card transaction before submission.